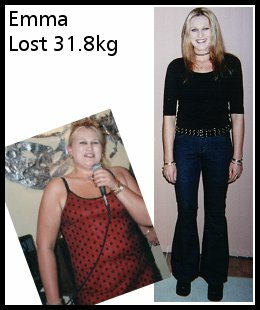 Yes, that is me in the hideous 'before' photo, and no, it wasn't puppy fat. Many people thought it was easier for me to lose the weight because my mother created and wrote the Kiwi KISS Diet. If anything, it was probably harder! My mother did provide the support I needed but I still HAD to do it and make the necessary behavioural changes. Ten years and 26 kilos later I can laugh at the names but they were hurtful and painful to me at the time. I lost the weight in twelve months following the Kiwi KISS Diet. 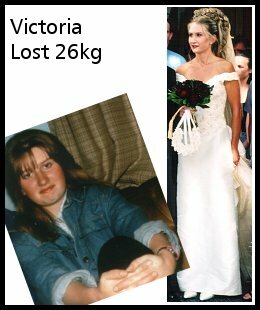 It wasn't difficult, there was no feelings of deprivation and once at my goal weight I was allowed extras. We are surrounded by opportunities but I was so blinded by my weight problems I just never saw them. Losing weight has changed so many aspects of my life. I have found new confidence, new clothes and new friends. I am now a qualified Fitness Instructor and Personal Trainer, and work full time at Kiwi KISS developing new recipes and teaching in the classes. For as long as I can remember I was always trying a new diet with my Mum but I would always sneak a chocolate bar or lollies. I knew I had a weight problem but at that time I wanted to have what my friends were eating. It wasn't until I saw a photo of myself at my sister's 21st and I thought "Please tell me that isn't me!" I looked hideous in a little red dress that really defined my spare tyres across my tummy. I went to my Mum, who was successfully losing weight on the Kiwi KISS Diet, and said "I am coming with you!". Now, after losing 31.8 kilos, it feels great to go shopping for the clothes I had longed to wear and I have no tears because I don't have to try and squeeze myself into these anymore. I never thought I'd do it - but I HAVE thanks to Carolyn and the support from her Kiwi KISS classes. 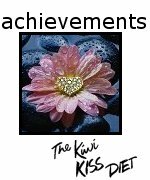 At Kiwi KISS we encourage you to continue attending classes after you have achieved Life Membership and twelve months after being awarded Life you are presented with our special crystal heart pin. This signifies that you have remained at your goal weight for a period of twelve months and is confirmation that you have taken the first step to maintaining your weight permanently.